Jason Vigna represents clients in complex securities, commercial and corporate governance matters in trial and appellate courts throughout the country and before the Securities and Exchange Commission (SEC). 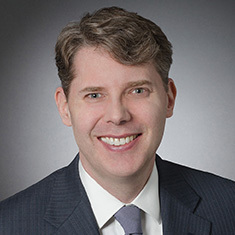 He has helped asset management firms, banks, technology companies, life sciences companies and other sophisticated businesses, as well as their directors and officers, successfully resolve disputes involving federal and state shareholder- and fraud-related statutes, including the Securities Exchange Act of 1934, the Securities Act of 1933, the Racketeering Influenced and Corrupt Organizations (RICO) Act and the Delaware General Corporation Law. He also has litigated a broad range of related common law claims, including claims for alleged breach of fiduciary duty, breach of contract, fraud and negligence. Among other matters, Jason prominently defended an asset management company and its employees in more than 60 high-profile class, derivative, bankruptcy and individual actions arising out of hedge fund investments made with Bernard Madoff. In addition, he represented a global banking and financial services company and its affiliates in their defense of claims brought by the trustee of the Bernard L. Madoff Investment Securities LLC estate. In that capacity, Jason helped obtain the withdrawal from bankruptcy court and pre-trial dismissal of all RICO, common law and clawback claims asserted against his clients in parallel multi-billion dollar lawsuits. That effort was named among the top matters in the Litigation and Dispute Resolution category in the Financial Times' 2013 "US Innovative Lawyers" report. He also coordinated the defense of 46 defendants represented by 20 law firms in securing the dismissal of three private class action lawsuits arising out of the same alleged acts. Before practicing law, Jason clerked for the Honorable J.P. Stadtmueller of the US District Court for the Eastern District of Wisconsin. Defense of the largest publicly traded operator of outpatient physical and occupational therapy clinics in the United States against allegations that it knowingly misstated various balance sheet liabilities that later needed to be restated. Obtained complete pre-discovery dismissal. Defense against, and “disclosure-only” settlement of, lawsuits seeking to enjoin the merger of a high-profile provider of online crowd-sourced reviews of local businesses and contractors and a subsidiary of one of the world’s largest media and Internet companies. Defense of a clinical-stage biotechnology company against allegations that it misrepresented the likelihood of European Medicines Agency approval for its leading drug candidate. Obtained complete pre-discovery dismissal. Representation of a global defense technology firm in a multi-faceted dispute with the former officers of its largest operating subsidiary. Obtained pre-trial settlement. Defense of one of the world's leading financial service providers in trial and appeal involving allegations that the client committed fraud and breached a contract in connection with its sale of a subsidiary. Obtained dismissal of the most serious claims. Defense of the former CEO and the former general counsel of the largest broker on the Chicago Mercantile Exchange against consolidated actions arising out of the company's collapse. Obtained complete pre-discovery dismissal. Representation of the special litigation committee of the board of directors of a very large international insurance and financial services organization in its investigation of allegations that senior officers breached fiduciary duties to the company. Preparation of underwriters of WorldCom, Inc. debt securities for trial involving allegations that the underwriters defrauded purchasers of WorldCom’s bonds. Defense of a prominent international financial and travel-related services company against allegations that it illegally traded securities of a company on whose board one of its executives sat. Obtained complete pre-discovery dismissal and subsequent token settlement.